Scrawlar is a new web tool that I just found out about from Larry Ferlazzo's excellent blog. This is an excellent site that acts as a virtual whiteboard/word processors for schools. It's a free collaborative tools that is ideal for education that it requires no student email for access, only a class code where a teacher creates an account. 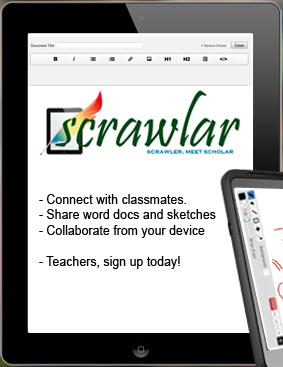 Best of all, Scrawlar can be used on any device and allows students to collaborate on projects/word documents. I highly recommend checking out Scrawlar by clicking here!! !